Cycling gloves that are a perfect fit for any cycling kit! 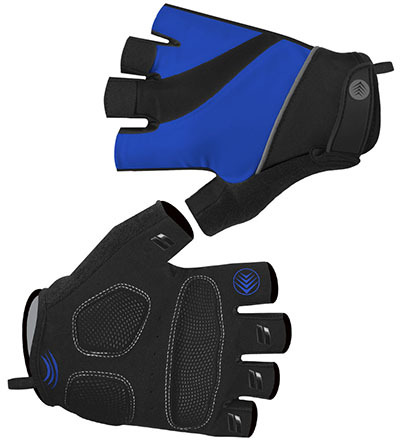 Ride longer and feel stronger wearing these comfortable and functional fingerless cycling gloves! 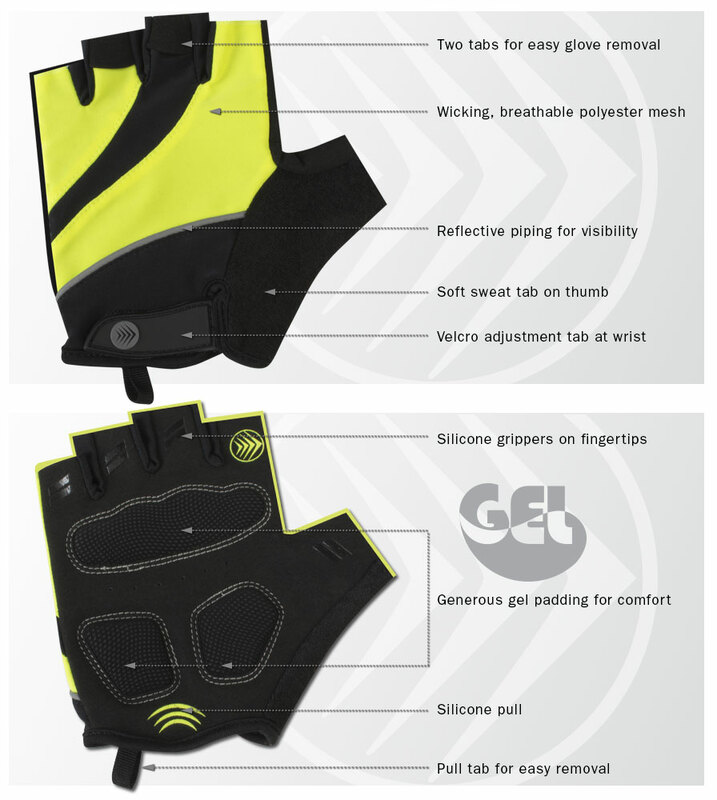 The Tempo 2.0 is an upgraded version of our gel-padded cycling gloves. Different look but same great features. The palms of the cycling gloves are padded with a generous amount of firm gel at all the right pressure points to keep hands feeling comfortable while you grip and numbness is avoided. The fabric gussets stretch to fit your fingers and have silicone grippers to improve your hold on the handlebars. The Velcro wrist strap easily adjusts to keep the gloves secure. The top of the glove is made with a wicking, breathable polyester fabric that will keep your hands dry. What will also keep you dry is the soft tab on the thumb to dab away sweat. Two finger loops and a pull tab on the bottom make removal easy. These gloves are machine-washable, so you can easily keep them looking fresh and clean for the next ride. Reflective piping is added for more biker visibility. With a variety of colors to choose from, you’ll be able to find a pair that coordinates with any of our Men's and Women's bike jerseys! Machine washable so you can use them again and again on all your cycling adventures. Tempo 2.0 Fingerless Gloves with Gel for Support and Comfort! I haven't had a chance to wear them yet, as it's winter glove season here. However, they fit well and appear to be well made. I look forward to using them when the weather warms. Comfortable fit. If you wear large, go a size up for looser fit and easy on and off. Light and just enough padding for recreational cycling. Fit is accurate; well made. I like the product have ridden a few times since i got them only problem i found is they fit tight around the thumbs otherwise they seem like good quality gloves. Just OK. I guess for the price they are a reasonable deal but don't expect to be amazed. These gloves look great and fit well. My hands are on the smaller side and I got the medium. Haven't tried them yet but definitely a better product than a similar pair I bought online last year. THANKS! A bit disappointed in the product, padding not as much as desired and not comfortable on long ride off road . I returned the gloves because they were too large. Great price for a great product. I just wish that they were available in Orange or yellow in my size when I ordered them. Perfect size for my hands and arrived on time. I use them every time I ride. Definitely make the ride more comfortable. Use gloves for road cycling, vert comfortable. Good Gloves for large hands. The best xxxl glove I could find for Mountain Biking. If xxl gloves are too small this glove is for you. These really help the long rides be more comfortable. Have held up real well in the 2 months I have been using them regularly. Nice, well made(in China)gloves. I bought a medium pair and a large pair, and they seemed about the same size. Snug, but usable. They run small. Order a size or two larger. Ordered the XL but the sizing is way small. The gloves are OK but suggest ordering two sizes larger than you think you need. Good padding well thought out placement.snug but comfortable fit. Glad I bought them. Very fast delivery and a cool little key chain as a bonus presento ! Nice touch. I ordered large first but had to order extra large and they are still snug. My rides are 30 - 80 miles typically . 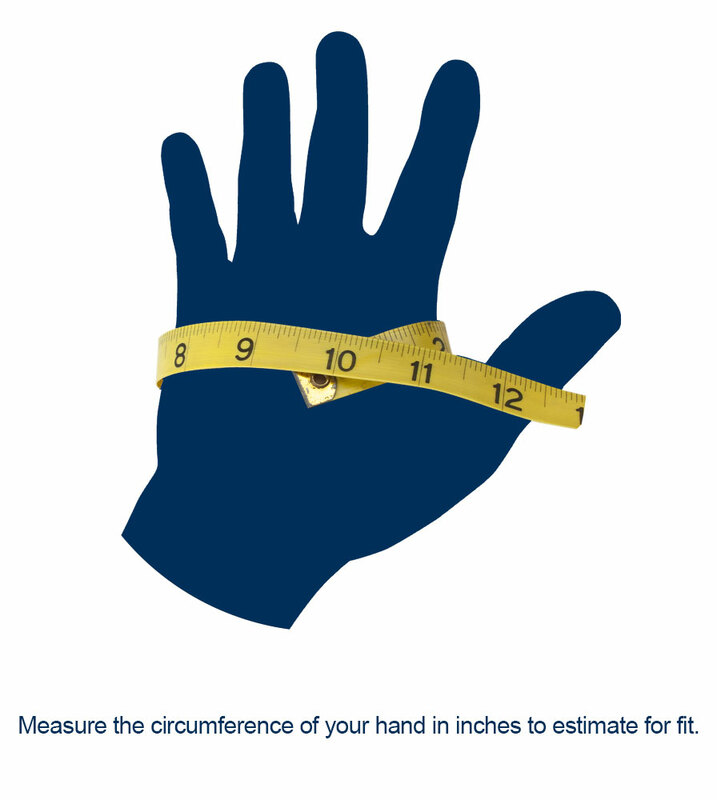 In the past I've noticed a need to have more protection for the median nerve in both hands. These gloves have helped eliminate nerve/compression discomfort. They are durable comfortable and the gel padding unparalleled.